Passwords are used to control who may do what within an application. Each application has its own password with settings that are specific to that that password. It is important to have a Password Policy. It would be best to work with your IT Support Specialist and staff to create a policy together. The policy should include the person/position who has Supervisor Level privileges to maintain the passwords for your NEMRC program. Each staff member who uses the program should be assigned their own password and set up with only the privileges needed to perform their duties. 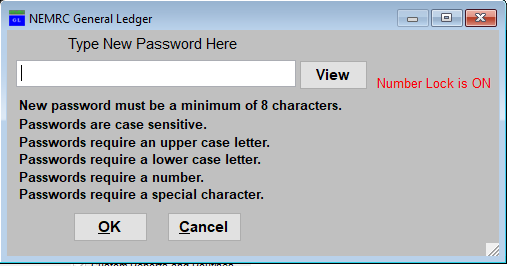 The password must meet the following criteria below. As you input your new password, each criterion will turn green when it is met. Once you have met the minimum you will be able to click ok and choose the privileges you want this password to have. Notice that the criterion is changing to the color green when it is met. Now you may set the privileges for this password. Once you have selected the password you wish to edit/delete or create a new password, you may change the Privileges that are set for that password. 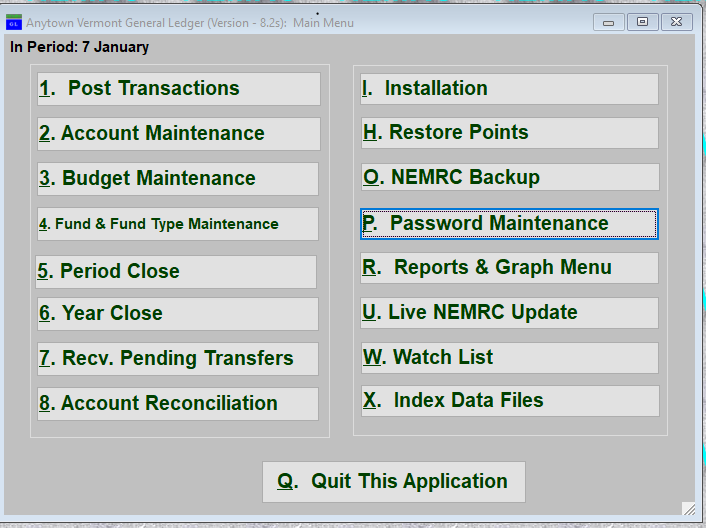 The following is an example of a General Ledger Module Password Maintenance screen. SUPERVISOR OPTIONS: If this password is to be for the Supervisor of this module, then check (by clicking) the box next to Supervisor Level Access. Otherwise, choose which privileges someone who used this password to log into this module may have. BUDGET MENU, MAIN MENU, REPORTS MENU: Under each of these headings there are options for specific privileges. You can choose one or a few. If you want this password to have all of the privileges under a heading then select each one or click the one box under the Supervisor Options. Example: Access to all main menu items. PUBLIC PASSWORD: This option allows you to set up a password with limited privileges that would be used by the “public.” In general ledger it would allow this password to have the ability to look at and run reports but not change any data. GENERAL LEDGER ACCOUNTS: This tab will allow you to limit the General Ledger Account access for this password. Example: Highway Foreman may want to be able to look at a budget report for highway fund only. A password would be set up with Access to all reports but for that fund only. SECURITY TIMEOUTS: This tab allows you to setup an option to timeout your screen or terminate a program. This is an extra security measure for those times when you are working, your program is open on your screen and you get interrupted. If it has a timeout or termination attempt set up, then anyone trying to gain access to that NEMRC program will need to know the password that was used to open it again. Once you have given all of the setup options consideration then you can Click “OK” to save the changes to the password’s privileges. CANCEL: Click “Cancel” to return to the Main Menu without saving any changes. DELETE: Click “Delete” if you want to delete this password. Be sure that you have at least one password set to Supervisor Level Access, or else you will lose Supervisor capabilities and will need to contact NEMRC to gain them back.